This outstanding little book was first published in 1975 and would probably have remained unknown outside France had it not been translated into English by Robert Chino back in 1984, collecting an introduction by Datus Proper (best known for What the Trout Said – get a copy) along the way. It is extraordinary to think of it, but despite Charles Ritz, until that moment, French flies might as well have been tied on the moon for all British and American anglers knew of them; Dr. Pequegnot ‘s book more or less single-handedly did the world the service of introducing us to the often radically different way of thinking that had evolved in his homeland. I was presented with a copy in about 1979, by my French girlfriend, the heart-stoppingly gorgeous Christine, who bore my endlessly repeated requests to translate the more difficult passages with remarkably good grace – and I was fired with ideas. I particularly remember being struck by the Pont-Audemer. This pattern takes advantage of the way some hackled dry flies are hell-bent on settling with the hook shank vertical in the water and deals with the problem by tipping the wing right forward so that it sticks up and acts as a sighting post. OK, the idea doesn’t sound so radical nowadays, but then, it was a revelation, as was Pequegnot’s casual mention that the pattern was probably derived from the British Mole Fly. Eh? went I, all those years ago, and promptly tied a bunch, discovering, to my amazement, that they worked a treat. One huge advantage of this particular pattern is that the vertical orientation of the hook in the water lifts the last couple of inches of the leader clear of the surface and this can make it much more effective in some situations than variations on the same theme, such as the more recent Klinkhamer and the whole family of parachute emergers we use today. The Pont-Audemer is only one of the reasons why this deceptively little book is a bit special: this was the book that introduced me to Cul de Canard and traditional Spanish winging twenty years before they became popular in Britain, and when you chuck in a plate that shows flies tied for carp which dates back to 1818, the message is it repays a bit of careful re-reading and then some. 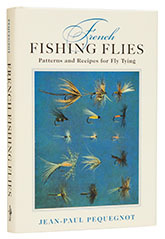 If there is a lot to learn from Pequegnot, the main disadvantage of French Fishing Flies as it was first published was that the patterns were illustrated with spidery line drawings, but although this new edition reprises the original English translation, the publisher has added an extremely useful colour section of flies tied by Yann le Fèvre, together with a further selection of vintage and modern patterns collected by Pierre Affre. Some of these show flies that aren’t described by Pequegnot, but colour plates are pretty much the making of this excellent book and if you don’t have a copy, I suggest you get yourself sorted right now.